Double barreled beauty products from Lise Watier, Avon Anew, CLEAN, Hard Candy and mark.! The day formula offers instant lifting which forms an invisible mesh on the skin’s surface for a visibly firmer appearance throughout the day while remodelling peptides promote a long-acting restructuring action - for skin that looks lifted and facial contours that look sculpted. The night formula takes advance of the skin's regenerative mode at night - boosted by the addition of squalane to the formula - and works to firm the skin from the inside and visibly improve skin density and firmness for skin that looks supple and smooth. Both formulas take advantage of DermEnergy Complex - composed of two amino acids, glucose and copper - to improve skin’s firmness and elasticity, strengthen skin and promote the production of collagen and elastin. Available mid-August at drugstores across Canada and online at www.lisewatier.com. Avon Anew Reversalist Complete Renewal Express Dual Eye System - 15g + 2.5g - $35 -with a hydrating eye cream and brightening veil formulated with tri-elastinex to instantly brighten the eye area and over time, diminish the look of fine lines and wrinkles around the eyes. CLEAN Warm Cotton & Cool Cotton Dual Ended Rollerball - 10ml - $24 -perfect for travelling to take two scents on the go which can be enjoyed separately or layered together to create a preferred CLEAN scent. Featuring a new technology called Cotton Vintage, incorporating cotton seeds, extracts and proteins, the fragrance adjusts to hydrate skin or wick away excess moisture and oil. Cool Cotton is uplifting with authentic notes of Italian bergamot, mimosa blossom and creamy musks while Warm Cotton is warm with notes of citrus, lilac, jasmine, amber and musk. Available now at Murale and murale.ca. 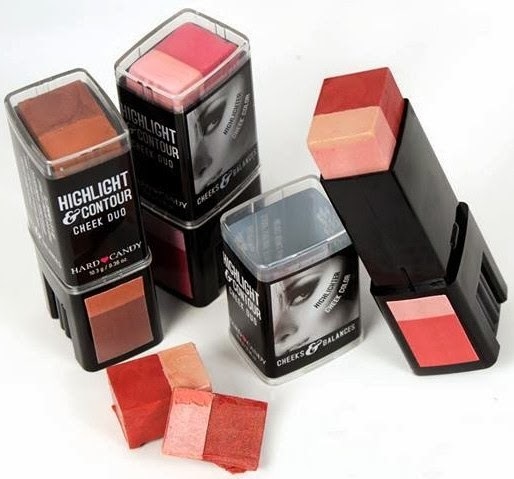 Hard Candy Cheeks & Balances Highlight & Contour Cheek Duo - $6.98 - in 3 shades: Cheeky Pink, Sun Kissed and Sweet Cheeks - a dual-tones stick that helps you create a multi-dimensional look in just one swipe - for the perfect amount of highlighter and blush/bronzer to sculpt, colour and illuminate in seconds! Glow Baby Glow Lip Gloss - $10 - in 6 glowing shades: Pretty Femme, Chica Luxe, Glam Luxe, Peeka-Boo, Girly Girl and Blow Kisses - with ultra high shine and mega moisture. On The Edge Liquid Eyeliner - $10 - in 6 new shades: Slate, Cleo, Medusa, Blue Chrome, Quick Silver and Bronze Edge - with a smooth, liquid formula and ultra slim brush for precise application.